RB Leipzig continued their exceptional unbeaten start to the season with an away win at the Volkswagen Stadium. They felled a Wolfsburg team who join the list of teams who failed to cope with the intensity of Hasenhüttl’s side. Hasenhüttl’s team were as intense as ever in their off-the-ball display. From their 4-2-2-2 shape, they were incredibly active in defence pressing high into Wolfsburg’s build-up of possession. Leipzig spent large periods of Wolfsburg’s possession in a mid-block state, allowing the centre-backs the ball but blocking any attempts to advance the ball forward. 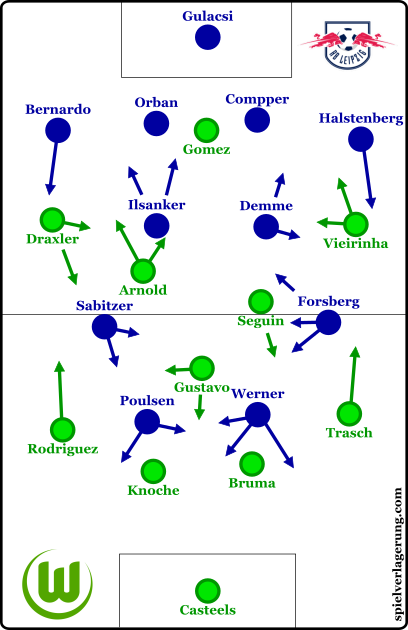 The narrow hexagon created by the front 6 players covered Wolfsburg’s midfield options well, whilst man-oriented movement emphasised their control in the centre. This was particularly evident on the left where Demme followed Seguin closely on the right of Wolfsburg’s midfield, whilst the coverage of Gustavo was less-so. On this side, Ilsanker would maintain a position of access on the defensive midfielder, whilst the cover shadow of the two strikers helped too to limit his availability during build-up. In this coverage of the midfield, Leipzig controlled the centre well despite Wolfsburg’s possession of the ball. They forced their hosts to develop attacks in the wider areas of the pitch, where they would increase the intensity of their pressure well. Animation: An example of RBL’s pressing in wider areas. Upon a short pass from a centre-back to the ball-near full-back, the ball-near winger would immediately press the full-back on receiving. The RBL full-back would stay tight to the ball-near winger to ensure he’s unable to fully support his teammate, even if it meant moving out of the defensive line. The two central midfielders would shift across whilst the ball-near one would cover a near option and the near striker blocks a pass back to the centre-back. On the opposite side, the ball-far winger comes inside whilst the striker drops to increase central coverage. Click here for an in-game example. Wolfsburg, like many teams to face Leipzig this season, had few hopes of developing attacks through the centre of the pitch. Almost from the beginning of the game, they focused their build-up through both flank areas and looked to attack accordingly. The strategical impact of Leipzig’s defence is interesting, as it forces teams into few options in preparation for the game. Opponents generally focus on constructing attacks down the wings, or go far more direct than usual. Few teams try to play through the centre or with short passes, as is such a risky plan against this pressure. As a result, they can adapt their style to deal with these few possibilities more accurately than a team which can be played against in a number of ways. Their distinct style of play forces teams into not only attacking weaker spaces, but makes them more predictable for Hasenhüttl’s team to play against. In Wolfsburg’s case, they did as many teams (including Borussia Dortmund) had done and focused on attacking the wings. At times they tried to play the ball to Gustavo in the middle but, encircled by 6 Leipzig players, he could only muster a return pass to his centre-back. Thus, a wing-focused was developed with fast vertical combinations down the wing spaces, looking to beat the initial Leipzig press then move quickly towards goal. They had more success when attacking through the trio of Draxler, Arnold and Rodriguez down the left side of the pitch. The former two were able to find gaps within the left half-space, in which they could receive direct passes from the centre-backs. Draxler and Arnold at times even rotated positions, with the winger coming inside to find space and the ball whilst Arnold would move into the channel vacated by his teammate. Through this pattern, they perhaps looked to disrupt the man-oriented nature of Leipzig’s defending, and they opened space for each other on a couple of instances. With Demme having a closer coverage of Seguin on the left of Leipzig’s defence, Draxler and Arnold were able to find more space on the right of it. Ilsanker didn’t stay tight to Gustavo but he was an important reference point for the CMs positioning nonetheless. Upon breaking through, Wolfsburg were able to create a some fairly-dangerous situations. The limiting factor however, was the position of the ball. After breaking through Leipzig’s press down the flanks, they were only able to penetrate the box with crosses, particularly down the left. They rarely moved the ball back inside with the threat of the opponents’ pressing and instead looked to find Gomez in the air. Yet Wolfsburg weren’t particularly accurate with their crossing, and a number of attempts were blocked well by the immediate defender. Leipzig’s coverage of the box was fairly effective too in restricting the crosses from resulting in any dangerous opportunities. When they did get an effort on goal, their shot quality was poor considering difficulties of cross-assisted shots. Continuing with the high-energy playing style, Leipzig were ever active in possession. Their build-up was somewhat patient, with Demme in particular seeing more of the ball while Ilsanker dropped frequently between and to the right of the two centre-backs. They would most often look to progress the ball into deep midfield through the two midfielders, then play vertically into overloads created by the front four. These passes would then break off into fast combinations which gained space quickly. When the possession was turned over, RBL’s fast counterpress ensured counter-attacks weren’t created and even led to some good chances. With Werner and Poulsen leading the line, Leipzig commonly played to the physical strengths of their attackers. Standing at 6’4, Poulsen is a good target for direct passes whilst he poses speed and agility too. His physical versatility made him useful in a number of situations, such as in aerial play, dropping deep or making movements in behind. Werner on the other hand, is extremely quick and very active off of the ball. He constantly attacked his man with movements behind the line, often into the channel between the RCB and RB. Through this, he offered a direct option as well as created space for Forsberg and Kaiser to use by forcing the defensive line into a deeper stance. Despite their two expected goals (as of Tegen11), Leipzig’s attacking wasn’t very threatening for the most part. Playing at such a high pace, many combinations broke down due to the complexity of passing at such speed. The synergy between movements and passes wasn’t always good which is understandable. Although Leipzig’s chaotic attacking struggled to form many dangerous attacks, when it did, Forsberg was usually the centrepiece. Technically the strongest out of the four, he was most comfortable in the high-speed attacking and was able to play calmly in a hectic midfield. Coming inside from his left-sided position, he found gaps of space well and used his pressing-resistance to find the two strikers in moments where teammates couldn’t. Wolfsburg join Borussia Dortmund on a growing list of teams who have succumbed to Leipzig’s pressing. Hasenhüttl’s team are quickly proving the doubters wrong, and even surprising many who expected success from the rising club. In this case, Wolfsburg tried to break the press through wider combinations involving their stronger players such as Draxler and Arnold. Ultimately they failed to create chances in doing so, whilst Leipzig’s vertical football and pressing was able to create chances on Casteel’s goal, in what is becoming a common sight early in the season. I am watching some of RBL games, and I really like the performance of them, a very estructurated, tight, compact team. Their pressing remains me Atletico de Madrid. This two teams know where to press, directing the game to the sides for pressing aggressively. I would like to see more with the ball, I think that they don’t take advantage of the position between lines of Forrsberg or Sabitzer. Forgive my english, is not good at all.